I wasn't expecting to feel so emotional about all of this. Yesterday was the beginning of JDRF Government Day (well, days). I knew it was coming, and had been looking forward to reading tweets and blogs from some of my favorite DOCers who were lucky enough to be able to participate. So my day yesterday was completely unproductive. I spent the day following the #JDRFGovDay hashtag on twitter, reading tweets from Kelly, Kerri, Scott, Kim, Scott, Mike, Allison, Cherise, and Kelly. Thanks, guys, for tweeting! It made those of us who couldn't attend feel more involved. And even better than the tweets? Video! JDRF Advocacy live-streamed one of the blogger roundtable discussions with some of the aforementioned people (view the video here). Seriously--you should watch it! I've also been promised the other roundtable (with more of the aforementioned) will be up on YouTube soon. I was feeling very irritable and tired yesterday (I blame the time change), and actually wasn't sure if I wanted to watch the webcast. Wasn't really feeling up to it. But I decided to watch it anyways. Boy, am I glad I did. I was surprised at the strong emotional reaction I had to the discussion. It was wonderful to see and hear some of these DOC people I consider friends. To see their faces. To hear what they had to say. At moments I laughed. Other moments had me in tears (K2 and Cherise, I'm looking at you). When it was over, I felt so encouraged and empowered. Yes, the JDRF has shown a staggering lack of support for adult T1s in the past. But it seems like they're really moving in the right direction. Reading tweets last night about the presentation from JDRF CEO Jeffrey Brewer was the icing on the cake. I was out to eat with my husband and parents, and was THIS CLOSE to bursting into tears in public. I was so inspired, I spent the evening watching this video of Dr. Aaron Kowalski talking about the Artificial Pancreas Project. It made me feel very hopeful for the future. Life with D is REALLY HARD!!! To see the JDRF finally giving some support to us grown-up T1s is truly moving. It caught me off guard. I really was not expecting the emotional reaction I experienced. So thanks to all my DOC friends for participating in Government Day and keeping us posted. Thanks to JDRF for reaching out to adult PWD. And thanks to everyone who's involved in Government Day for advocating for us. For me. I'm looking forward to more tweets and blog posts in the coming days about it all. And yes, I'll keep the tissues handy. YAY!!!!!!!! It was so awesome!!!!!! That round table discussion completely made my day :) Yup...LOTS OF TEARS! Was great to watch the round table video. So nice to see the tweeps 'in the flesh'. Way to go guys & gals! What a great post, Jess. It's incredibly inspiring and mind-numbing to be a part of all this and an incredible community. Glad to see the JDRF finally recognizing that we ARE a community and that it's time to work together for everyone's mutual interests. And to be the presence of such awe-inspiring DOCers? Wordless. Thanks for spreading the word and being awesome. Jess - your post makes ME cry! I was so proud and humbled to be able to represent our great DOC at Government Day. Thanks so much for being a part of it, and writing this! It was great being on Upstream, and thanks to the DOC and the Upstream webcast, I've started my own diabetes blog too! 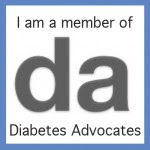 I'm so happy to find your blog and to become a diabetes blogger too! I'm tweeting and blogging, and I feel so empowered to do something! My blog is http://alizawithdiabetes.blogspot.com and I'm @alizachana on Twitter. Looking forward to seeing you around the DOC! :) Your post is awesome!